altered the Lower Bay subsystem. 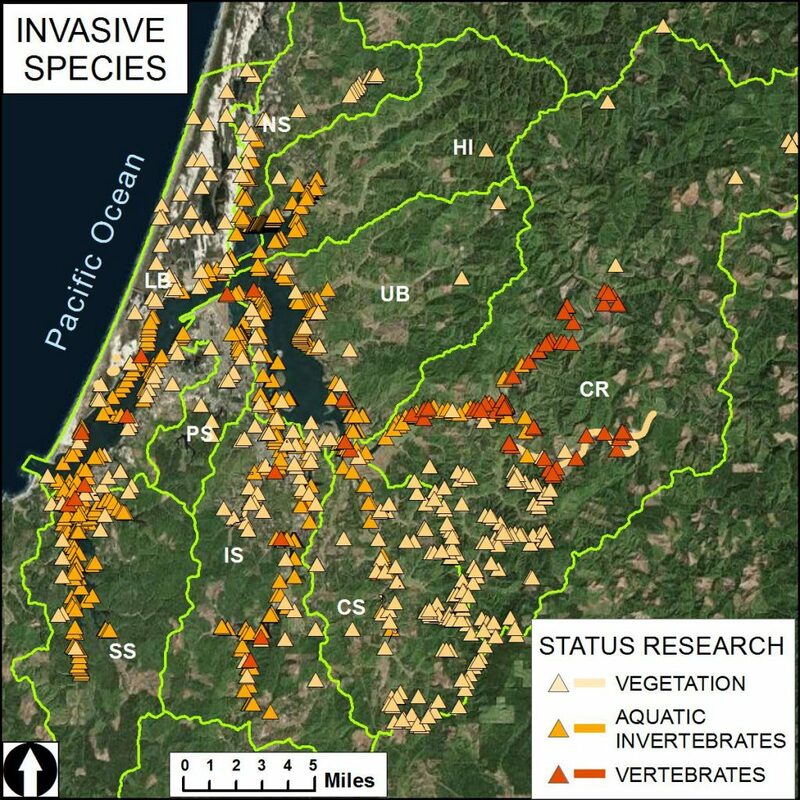 Coos estuary; additional invasions are likely. the status of most of these species. though local forests are at risk of invasion. non-native American shad and striped bass. literature (Kovacs et al. 2010; Nowak et al. levels of hermaphroditism in striped bass) . been undertaken in the project area (e.g. agency scientists, and local experts. intermittently in Oregon (e.g., gypsy moths). proximity to the project area. the late 1970’s and 2006.
all fish (e.g., larger more mobile fish species). map should be used with caution. in Coos River Estuary, Oregon. M.S. Thesis. Francisco Bay: The Urbanized Estuary. quoianum) in Coos Bay, Oregon. M.S. Thesis. Hacker, S. D., P. Zarnetske, E. Seabloom, P.
Ruggiero, J. Mull, S. Gerrity, and C. Jones. their Colonization, Spread, and Impact. Oikos. Howard, V., M. Pfauth, M. Sytsma, and D.
Plan. Portland State University, Portland, OR. W. Siegert, and Andrew M. Liebhold. 2010. Laferriere, A. M., H. Harris, and J. Schaefer. United States. Journal of Economic Entomology. Oregon Department of Agriculture (ODA). Oregon Department of Forestry (ODF). files]. Accessed 10 March 2015: http://www. Oregon Department of Forestry (ODF). 2014b. Forestry, Salem, OR. 2 pp. (USDA). 2003a. Gypsy Moth in North America. Problem. Accessed 7 July 2015: http://www. Trees. Accessed 7 July 2015: http://www. Gypsy Moth – Lymantria dispar dispar. (USDA). n.d.b. Success Story- Gypsy Moth. Accessed 6 July 2015: http://www.fs.usda. as a Model System. Biological Invasions.